The British premium brand MINI is presented at the 2015 Geneva Motor Show with new diversity in its model program and fresh accents for individual style and extreme driving fun. The new models on show further extend the breadth of the MINI experience, characterised by strikingly expressive design, agile handling and premium quality. Seeing its world premiere at the 2015 Geneva Motor Show, the new MINI Countryman Park Lane embodies the strengths of the five-seater all-rounder more impressively than ever with its four doors, large tailgate and optional all-wheel drive system ALL4. The edition model's exclusive design and equipment features highlight the variable space concept of the MINI Countryman as well as its athletic flair on all types of terrain. Another new member of the MINI family enriches everyday traffic with a dash of irresistible driving fun: the new MINI John Cooper Works unleashes pure passion for performance – not least thanks to 55 years of motor racing experience and an engine which is more powerful than any ever used in one of the brand's serial production models. The MINI John Cooper Works is the latest and fastest new model since the original in the small car premium segment saw a change of generation. Its body concept is based on the new MINI 3 door, which is now taking the roads of the world by storm itself with its increased athletic flair and efficiency, optimised ride comfort, increased interior space and innovative equipment features. Likewise presented to visitors at the Geneva Motor Show from March 5th - 15th 2015, the new MINI 5 door meets the need for additional space and convenient entry to the rear. Versatile, individual, exclusive: the new MINI Countryman Park Lane. MINI has entered a new phase of its success story by venturing into the premium compact segment. The MINI Countryman combines the brand's distinctive style with a generous and versatile interior. The characteristic MINI agility in terms of drive response is experienced in a new way due to the raised seating position and gains a fascinating added dimension in conjunction with the optional all-wheel drive system ALL4. The new MINI Countryman Park Lane epitomises the versatile qualities of this all-round talent more attractively and exclusively than ever before. Its high-quality individual style is underscored by a design and colour concept developed especially for the edition model. The body finish in Earl Grey metallic is combined with the entirely new colour variant Oak Red for the roof and exterior mirror caps as well sport stripes in the same colour as an optional extra. 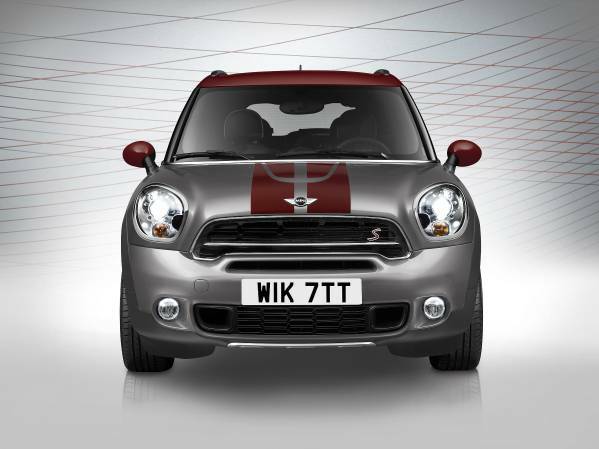 The MINI Countryman Park Lane boldly accentuates its classic athletic character with 18-inch light alloy wheels in Turbo Fan Dark Grey design and the MINI ALL4 Exterior visual package including silver body elements for the front and rear apron as well as the side sills. Emblems on the side scuttles and cockpit surface bear the inscription "Park Lane" as do the entry sills. The interior surfaces in Cross Stripe Grey were likewise designed exclusively for the MINI Countryman Park Lane. These go together with the inlay colour Carbon Black for the door trim and centre console to create a sports-style premium ambience in the interior. The MINI Countryman Park Lane is optionally available with the all-wheel drive system ALL4 in all model variants. The edition model can also be combined with a particularly high-end equipment package. As the MINI Countryman Park Lane Chili, the all-rounder's additional features include LED fog lamps, sports seats in fabric/leather, automatic air conditioning, the Sport Button, a rain sensor with automatic driving light control, sports leather steering wheel with multifunction buttons and a storage and lighting package. Top athlete in the small car segment: the new MINI John Cooper Works. Once again, the John Cooper Works logo on a MINI is an unmistakable sign of extreme driving fun in everyday traffic. The latest version of the MINI John Cooper Works (combined fuel consumption: 6.7 l/100 km, combined CO2 emissions: 155 g/km) merges intense racing passion with the optimised qualities of the latest MINI generation. Its completely new 2.0-litre 4-cylinder engine with MINI TwinPower Turbo Technology mobilises a peak output of 170 kW/231 hp, making it the most powerful engine ever to be installed in one of the brand's serial production models. Developed with motor racing expertise and featuring technological details in the suspension, body and cockpit that are exactly harmonised with the high level of performance, the engine's exceptional spirit can be precisely controlled for enormous driving fun. The overall package for extreme performance includes a sports suspension with Brembo sports brake system, exclusive John Cooper Works light alloy wheels, the John Cooper Works aerodynamics kit, particularly large air inlets and a model-specific interior in sports-car style. The new MINI John Cooper Works sprints in 6.3 seconds from standing to 100 km/h. With the 6-speed Steptronic transmission available as an alternative to the 6-speed manual transmission, this sprint takes just 6.1 seconds. What is more, in conjunction with the automatic transmission the fuel consumption of the new MINI John Cooper Works according to the EU test cycle is reduced to 5.7 litres per 100 kilometres (CO2emissions: 133 g/km). Hello! Were You Able To Spring Forward?